Landing pages are often made to send the most targeted traffic. This might be through PPC ads or organic searches. The point is — you need some action here. A successful landing page can directly push the bottom line of your company. And a poor one can cost you thousands of dollars (especially if you are directing paid traffic to it). 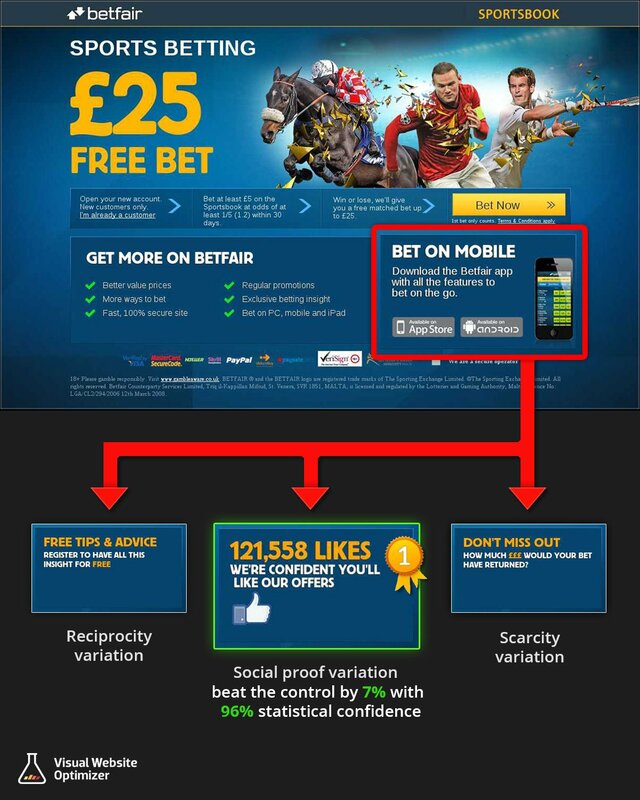 “Adding social sharing buttons is good for SEO and can make your page go viral.” Like seriously? Is that what you’re thinking? Tell me how many times have you seen people share a marketing offer on social media? Better still, it’s probably fair to ask you to decide, what do you want? More real conversions or social media followers? Okay, maybe I’m being too harsh. It’s a controversial topic. But if you ask me, I would say social media buttons, in most cases, are a distraction for your conversions. They have nothing to do with your offer. Preferably, you should not have them on the page. Notice how the social media icons are strategically placed and attributed with the subtle brown color to make sure that they do not “steal the thunder” from the main call-to-action. No matter how you see this, don’t be the know-it-all judge. Let a quick A/B test decide this for you. The problem is, people use them thinking that it makes their site prettier. But pretty is not enough. They have to be relevant too. Marketing Experiments confirms this with a case study. The real image of the company’s Founder on the landing page was tested against the Control, which showed the stock photo of a smiling girl wearing headphones. 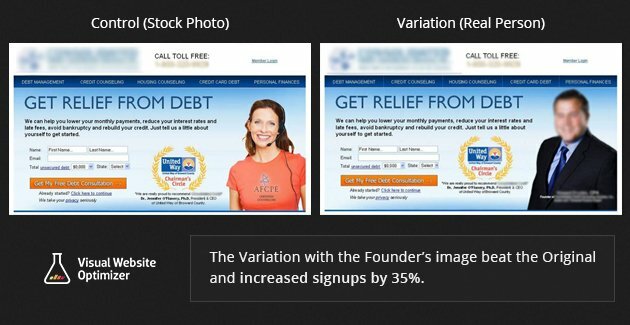 The Variation (with a real person’s image) beat the Control and increased signups by 35%. Stock photos look phony and can reduce your credibility. It’s time you replace them with a more “real” face. The main takeaway here is to use photos of real people that communicate value. Generalized stock photos won’t cut it for you anymore. Did you see how the “forced” expression looks both funny and sad at the same time? It makes readers instantly feel “Aww, don’t be sad. I’ll just do it!” And tada! It’s done. Use your human photos to evoke the right emotions and see how it goes for you. There’s also a possibility that sometimes a real person’s image may not increase your primary conversion goal. But before you give up on it, do check how it affects your other goals, like bounce rate, repeat visitors, and number of pages per visit. This is because these are the goals that are good indicators of the credibility of your site. For more examples and understanding of how you can use human photos the right way, you can read this awesome article by Get Elastic. I understand. You’ve put in a lot of effort to make a name for yourself. You’ve done some mind-blowing work. You have a popular mobile application, offices all over the world, and a lot more. So probably bragging a little about all of this might make visitors realize what a great brand you are. Maybe you have thrown in 2-3 lines to talk a little about your company too? Okay, you really need to hold your horses right there, smart pants! Now all this isn’t really related to the offer on your landing page. Is it? If it’s a “no,” just remove it from the page. Any element that doesn’t contribute to your primary call-to-action on the page should be removed. When people “skim” through your landing page, your design should lead the conversation in their mind. Font size, bold text, image size, you can use all this and a lot more to guide the thought process of your prospects that finally lead them to your conversion goal. 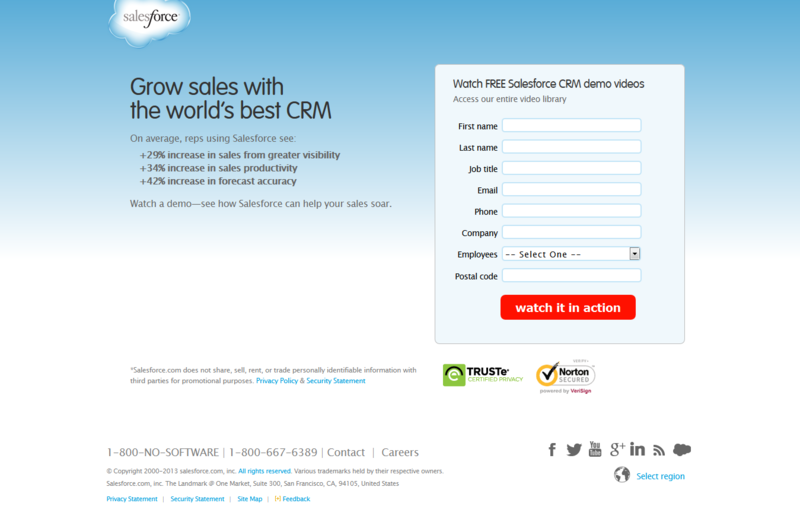 The visual hierarchy on the above landing page seems good. The F-shaped scan pattern of visitors will make them notice the brand first. The second element they notice will be the well-contrasted call-to-action button on top right. And the third will be the credentials of the speakers. But wait a minute. Did I miss something? Yes! What’s this whole thing about? So now you will have to go back to carefully look for the headline. 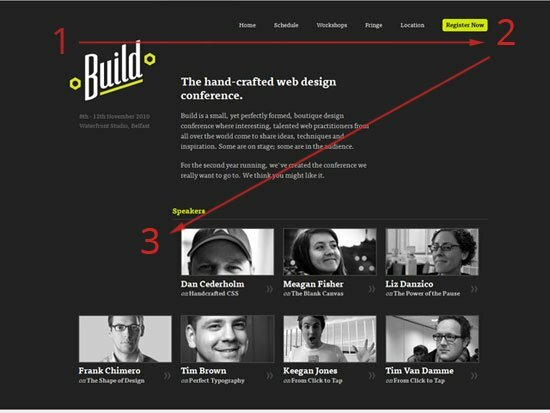 And there you have it – it’s for the web design conference. So, the one thing that I would want to change on this page is, to increase the text size of the headline. I think it will almost be ignored in the natural eye pattern of visitors. Not sure if you’re doing it right? Try the exercise mentioned in this article to test the visual hierarchy of your landing page. Another important thing to remember in visual hierarchy is the right placement of your call-to-action button. Sometimes it is important that you nurture the prospects before you show them the call-to-action. Our client, Underwater Audio, did just this and improved their visual hierarchy, which increased their online sales by 35.6%. Best practices may work for “majority,” but there’s no “one size fits all” solution to increase conversion rate. For example, almost all of us know that short copies often perform better for landing page conversions. But that’s usually the case with free signup offers or quick lead generation forms. When you want people to submit their credit card information or pay for your offer, you will normally have to explain them more. And persuasion requires more words. The higher the price you expect them to pay, the longer your copy runs. Firstly, this isn’t really a landing page so why draw traffic to it? 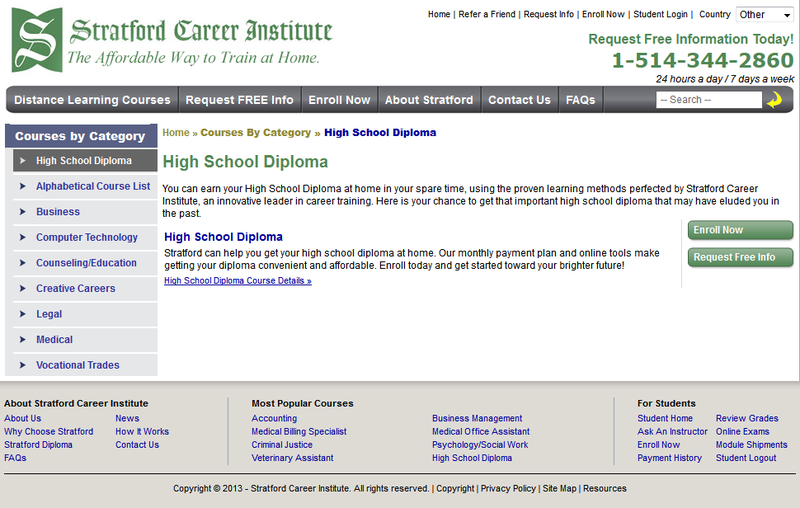 Secondly, how can anyone give just two lines for an offer like “high school diploma” and expect people to enroll for it? The obsession for the short copy is fine. But please provide your prospects with the most basic information about the course when you ask them to enroll. And this is just one example. People follow best practices all the time without questioning its reasoning in their case. Please don’t be that “naive” marketer who copies best practices blindly. The headline is one of the most noticeable elements on a landing page. Make it as simple and clear as possible. You can highlight any primary benefit or solution that your offer provides. Or, you can use your headline to make your prospects notice some facts that convince them more about the offer on your landing page. Data often helps influence people easily. See how Basecamp uses the “herd mentality” and communicates convincing data through their headline. 5,866 signups in 7 days clearly suggests that the product is useful and is therefore used by so many people. Here’s a great article by Marketing Sherpa that talks about all that you need to know about creating compelling headlines for your landing page. Don’t make your visitors feel disconnected. Match their expectations at every step. Just like your design, your copy should talk only about your offer and nothing else. Rest is clutter. About the company, what you guys do, is all blah! Please don’t bore people with speeches here. It will only make them leave. Using words that are actually used by your target audience can help them relate better. For example, if they prefer “cart” instead of “basket,” that’s what your copy should say. There’s so much more that you can do in your landing page copy. It can be a different topic altogether. I wrote about it a few weeks back. You can read this article if you want to know about the subtleties of writing landing page copy that converts. Having a hard time figuring out a killer value proposition? This article may help. 8. I Cheated! I Only have 7. You Tell Me #8? What’s your biggest landing page mistake? Any idea how much it cost you? Let’s hear it in the comments section. He he…loved the ending. Probably my biggest mistake was writing an emotionless copy, dispassionate might sound better really. Liked the sassy style of this article. Different. 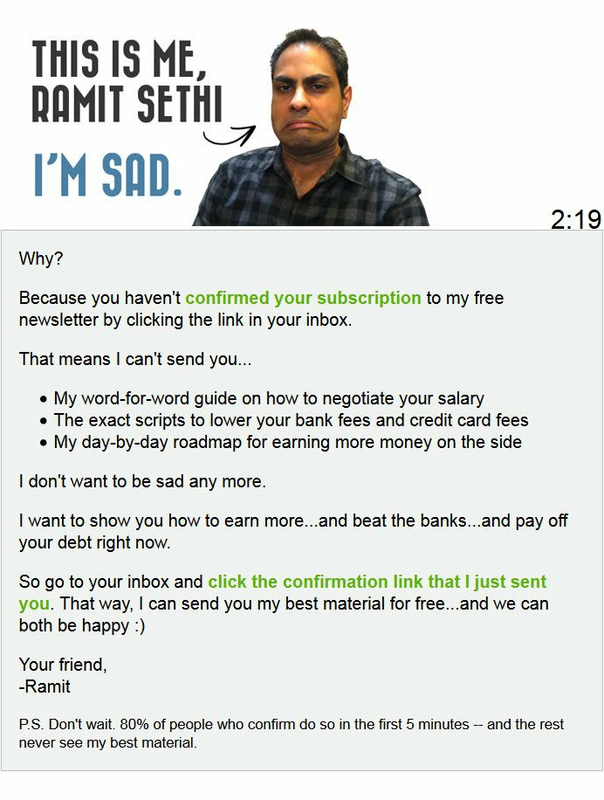 Ramit’s photo is hilarious and unique! And ugh, finally, a test result attacking stale stockphotos. I hate those. My landing page tip is to stop trying to be creative with designs and copy. They almost always hurt conversions. It’s amazing. A simple design with headline, bullets, and CTA just converts. Similar to Kevin, buttons worked but went to the wrong place on the site! My worst mistake is related to SEO. A couple of years ago we used to overoptimize for search engines instead of writing user-centered copy. Mea culpa. We no longer do it, of course. The copy and social buttons hit home. Writing to a “company”, rather than a “human” seems to put people to sleep. My previous company used to get so wrapped up in sounding “professional”, they alienated the majority of the small business owners we were trying to target! As for social… Like us all you want… AFTER you sign up! We now put all of our social elements on our sign up thank you page for a 26% conversion to followers on either Twitter or Facebook. 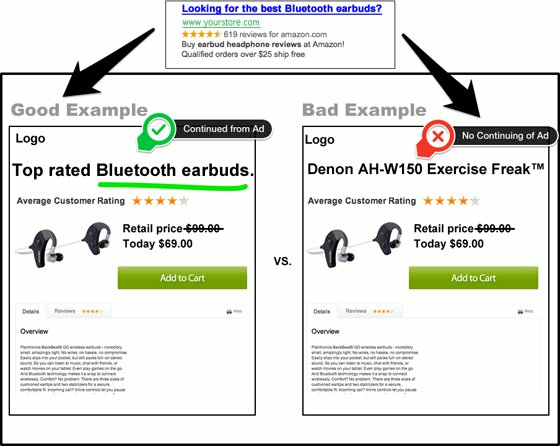 @Hangon – Yeah, placement of buttons can impact conversions to a great extent. We even have a case study related to this. You can check it here. @Joshua – I think if you’re using creativity to make things simpler for your users, there’s nothing wrong with that. But I believe, you mean, creativity that makes thing subtle for customers hurt conversions. And I +1 you on that! Balancing SEO with conversion rate optimization (CRO) is the key for a successful online business. The sad part is, people who understand CRO often forget to take into consideration the intricacies of SEO and vice versa. Thanks for sharing this! @Erik – That’s awesome! I hope other people also start using their thank you page for social sharing goals. Or, requesting customers for a quick 1-minute survey is also a great way to use your thank you pages.